“I can’t see it…is it me?” I watched a young woman step closer to the canvas titled, Uncle Rudi. She was now physically closer and she was looking hard, but the image kept its distance. Meaning in Gerhard Richter’s art can also keep its distance. The elusiveness of meaning is, in some ways, a central subject of Richter’s art. Since the early 1950s, Richter has painted a huge number of subjects in wildly conflicting styles. For most artists, one style emerges and evolves slowly, almost imperceptibly, over the course of their career. This is because artists often continue to work through problems that remain relevant and perhaps, because they achieve a degree of recognition and the market then demands that style. In other words, collectors often want what is known. Artists who abandon their signature style do so at some risk to future sales. Still, some artists do push in startlingly new directions. Willem de Kooning abandoned abstraction for the figure against the advice of his dealer, and Pablo Picasso famously pursued opposing styles simultaneously—think of his volumetric, even bloated Neoclassicism compared to the collages where he pressed flat every volume in sight. During Richter’s long career, he has produced art in an unprecedented number of conflicting styles starting with the propagandistic Social Realist art he made as a student at the Dresden Art Academy in Communist East Germany. After his move in 1961 to Düsseldorf in the West (via Berlin—the wall was begun the same year), he co-founded a German variant of Pop art which he, somewhat jokingly, termed Capitalist Realism. Since then he has painted high-pitched realism (sometimes blurred just enough to soften the image, or sometimes wiped or scraped beyond all recognition) and produced representations of abstraction (as opposed to abstraction itself). He has explored many of the most pressing visual issues of our time, the relationship of photography to painting, memory and the image, art’s role in the representation of war and politics, and perhaps most importantly, the impossibility of fixed meaning. Richter was born in Dresden, Germany on the eve of the Second World War. His two uncles were killed in the war and his father served, but survived. His schizophrenic aunt, Marianne, was murdered by the Nazis as part of their drive to euthanize the sick. Less than a week after his thirteenth birthday, Richter heard some 3,600 British and American planes drop more than half-a-million bombs on Dresden (he then lived just outside the city). 25,000 people were killed in these raids and the Soviets would quickly occupy Eastern Germany. Unlike the idealized, classicized nudes that Adolf Hitler had promulgated, the young Richter was taught Social Realism at the Dresden academy, a celebration of the heroism of communist workers. Once in the West, Richter found that the relationship between image and ideology reversed yet again. Here, images in advertising and popular culture celebrated material wealth and the culture of capitalism. 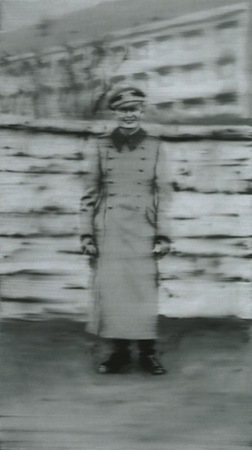 Under the Nazis, under the Soviets, and in the West, Richter saw art used to express political ideology. His art, while deeply concerned with politics and morality, rejects the very possibility of answers, even of the idea that we can know. Uncle Rudi, the painting the woman had stepped closer to see, is painted in the grays of a black and white photograph. It is small and has the intimacy of a family snapshot. We see a young man smiling proudly and awkwardly. He is clearly self-conscious as he poses in his new uniform. One has the sense that a moment before he was talking to the person behind the camera, likely a friend or family member. Rudi would die fighting soon after the photograph that is the basis for this painting was taken. This is the artist’s uncle, the man his grandmother favored and the adult the young Richter was to model himself after. But nothing in this painting is clear. Not the relationship between the artist and his uncle, not the tension between Rudi’s innocent awkwardness and his participation in Nazi violence, not even in the relationship between the photograph and Richter’s painting. The artist has drawn a dry brush across the wet surface of the nearly finished painting, and by doing this, he obscures the clarity of the photograph, denying us the easy certainty we expect. Richter reminds us that Uncle Rudi, like all images, promise and then fail to bring us closer to the people, things or places represented. Cite this page as: Dr. Steven Zucker, "Gerhard Richter, Uncle Rudi," in Smarthistory, August 9, 2015, accessed April 23, 2019, https://smarthistory.org/gerhard-richter-uncle-rudi/.